ST. PAUL, Minn. — More than seven years have passed since the Wild traded Brent Burns. Finally, there’s a reason in Minnesota to stop wincing about dealing away one of the NHL’s most potent defensemen. Matt Dumba leads all blue-liners in the league with 10 goals, a rate that translates to 34 scores over a full schedule. That’s a staggering pace that would crush the franchise record, set by Burns with 17 goals in 2010-11, his final season with the Wild. It’s doubtful Dumba can double that, but it’s clear that the $30 million, five-year contract the Wild gave him prior to this season was a worthy investment. “It’s fun. I think it’s sustainable if I keep hitting the net and not try to do anything too tricked up or too special. 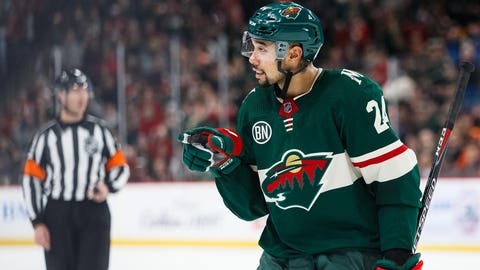 Guys are kind of getting it to me more often and finding me more often,” Dumba said last week, after his two goals helped the Wild beat Ottawa 6-4 . “That was an absolute muffin,” Dumba said. “He’s going to score as long as he keeps shooting the puck and hitting the net because his shot is that good,” coach Bruce Boudreau said. In Minnesota’s 4-3 loss to Arizona on Tuesday night, Dumba had an assist to stretch his streak to seven straight games with at least one point. That’s tied for the team-record mark for defensemen to match Ryan Suter‘s run in 2013. “We’ve got to get him to play a little bit both ends of the ice type of thing, but scoring 10 goals as a defenseman is quite the feat,” Boudreau said. “I get to watch the offensive ability and also not have to feel like there’s going to be a 2-on-1 every time he’s on the ice, because I can’t think of a time that he’s made a poor decision as far as getting in offensively,” goalie Devan Dubnyk said. That’s how he gets paired with Suter as the Wild’s most-used duo. He’s averaging 24 minutes per game, just 45 seconds behind Suter for the team lead. Dumba’s shooting percentage is also up to a career-best 12.8, the fifth-best on the Wild, another sign of growth. Burns has averaged 55 points per season over the last seven years, and he won the Norris Trophy in 2016-17 as the NHL’s best defenseman. If Dumba keeps improving, well, he could find himself in the conversation for that award someday.